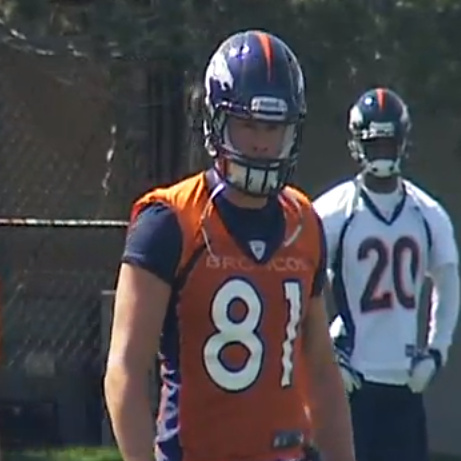 The Broncos were back on the practice field to continue OTAs on Thursday. It marked the first day of practice for newly-signed defensive back Quentin Jammer, Von Miller once again wore bold socks, and there were a few skirmishes. But the most notable news came after practice when Coach John Fox addressed the media. According to Fox, tight end Joel Dreessen had a knee scope procedure, which will keep him out of OTAs. Thankfully, Fox says Dreessen will be back in time for training camp. With Dreessen sidelined, Fox noted that third-year tight end Julius Thomas will see extended time with the starters. Based on reports from practice, it sounds like Thomas is already making the most of his opportunity.